Essilor, the world’s leading ophthalmic optics company and the makers of Crizal®, Transitions® and Varilux® warns the general public against unscrupulous individuals who go around the country claiming to be eye doctors and collecting money for eye refraction supposedly on behalf of the company. This warning is being issued in response to complaints from consumers who were approached by these pseudo eye doctors for eye refraction in exchange for a fee, and were given an Essilor order form as proof of purchase. No eyeglasses were said to have been provided during or after these transactions. The company is currently investigating these complaints and will exercise all legal actions against those deemed guilty of the offence. 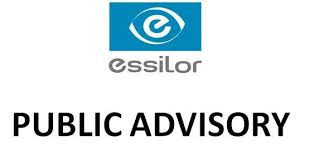 The public is advised that Essilor Philippines does not in any way solicit money for vision screening outside of its accredited vendors, clinics, and licensed eye care professionals. Consumers who require eye refraction are advised to visit accredited optical shops, eye clinics and deal only with licensed optometrists and ophthalmologists. The company also conducts vision screenings in select communities for free. Essilor does not sell its products directly to consumers, but through accredited optical shops, eye clinics, and licensed optometrists and ophthalmologists. Essilor Philippines requests the public to beware of this scam and to report any suspicious transactions and individuals engaged in this fraudulent act at www.essilor.com.ph. The world’s leading ophthalmic optics company, Essilor designs, manufactures and markets a wide range of lenses to improve and protect eyesight. Its corporate mission is to enable everyone around the world to access lenses that meet his or her unique visual requirements. To support this vision, the Company allocates over €160 million to research and development every year, in a commitment to continuously bring new, more effective products to market. Essilor’s flagship brands are Varilux®, Crizal®,TransitionsTM, Xperio® and OptifogTM.